India is emerging as one of the fastest growing transport air conditioner & refrigeration markets in the Asia-Pacific region. Owing to government infrastructure projects such as metro rails, expansion of state & national highways and rising disposable income on travelling, adoption of comfortable lifestyle are expected to fuel the market for transport air conditioner & refrigeration market in India. Increasing number of tourists, school & institutional buses and reefer trucks usage in cold chain industry would boost the demand for transport air conditioner & refrigeration systems in the country. According to 6Wresearch, India Transport Air Conditioner and Refrigeration market (includes bus, rail and truck air conditioner & refrigeration system) market touched $107 million in 2015. In India Transport Air Conditioner & Refrigeration market, rail segment market accounted for majority of the revenue share followed by the bus segment. In service market, new installation segment held key market revenue share followed by the maintenance and modernization service market. New installation market is expected to maintain its market leadership through the forecast period. The report thoroughly covers the market by types, verticals, and regions. The report provides unbiased and detailed analysis of the on-going trends, opportunities, high growth areas, and market drivers, which would help stakeholders to device and align market strategies according to the current and future market dynamics. • Historical Data of India Transport Air Conditioner & Refrigeration Market Revenues for the Period 2012-2015. • Market Size & Forecast of India Transport Air Conditioner & Refrigeration Market Revenues until 2022F. by Application Segment for the Period 2012-2015.
by Application Segment until 2022F. Capacity for the Period 2012-2015. • Market Size & Forecast of India Rail Air Conditioner & Refrigeration Market Revenues by End-User until 2022F. 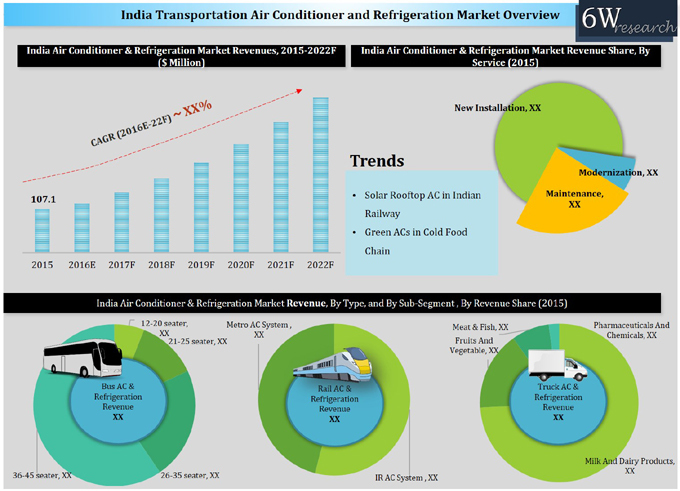 • Historical Data of India Transport Air Conditioner & Refrigeration Market by Services for the Period 2012-2015. Revenues by Services until 2022F. Revenues by Regions until 2022F. 12.1 Carrier Airconditioning and Refrigeration Ltd.
12.4 Guangzhou Jingyi Automobile Air Conditioner Co. Ltd.